So I had hoped to get a definitive diagnosis today at the doctor. No such luck. The x-ray came back negative, which wasn’t a huge surprise since stress fractures and tendinitis don’t usually show up on x-rays. Or at least the stress fractures that do show up are either really, really bad ones or ones pretty far down recovery road. I was pretty sure I had neither. So next up: an MRI next Thursday. They could have fit me in a few days earlier, but I’m visiting my parents at the beach. Thursday means I will come back a day early instead of missing the whole week. The doctor said that it could be a metatarsal stress fracture, but that one point in our favor (of it not being a stress fx) is that my pain is in my 4th toe/metatarsal, while most stress fx are the 2nd or 3rd. The other viable candidate is Morton’s Neuroma. I had ruled it out pretty much right off the bat because I had read that it felt like you were standing on a pebble, and my foot didn’t feel like that. But it does, when I do try to put weight on it it feels like I’m standing on a towel or a cotton ball. Mostly, there’s pain when I flex the ball of my foot with any kind of weight. So tomorrow I will try to drive and see how that goes (it’s my right foot). I think it will be ok, but ??? Cat feet are awesome. 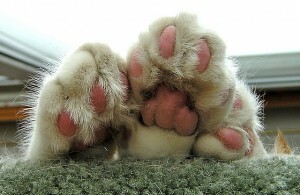 More specifically, cat toes are awesome. I initially did a creative commons image search for “foot injury.” I don’t recommend it. I saw some very gruesome images. But on the upside, I still have all my toes. I am not dealing with antibiotic resistant, flesh-eating bacteria. Chances of amputation are very low. So it’s more waiting. And whatever core work I can do that doesn’t aggravate my feet. Oh, and finishing the syllabi and writing project I have overdue. Just don’t Google images of trenchfoot.